I have been into beef tri-tips the past few months. It is a tender and beefy cut that, to me, is every bit as good as a roast tenderloin. In fact, I might like it better. Last week I reverse seared a tri-tip, which is a technique of slow roasting to the done point and then finishing with a quick red hot sear. This week I am using a technique called "raised direct" which is when you grill over hot coals but with distance between the food and heat. Served with salsa and charro beans. 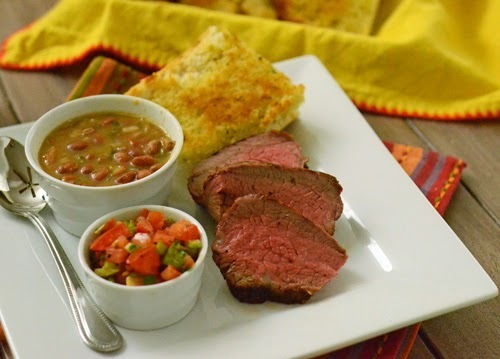 The recipe for the charro beans comes from Steven Raichlen's BBQ USA. We made it pretty much as written and these will definitely be joining our table anytime we make TexMex meals from now on. Season the roast with the remaining ingredients. Wrap with plastic wrap and refrigerate for 4-6 hours. Take off of refrigeration during the last hour and let rest at room temp. Set up your grill for raised direct heat (see notes below) and preheat to 400f. 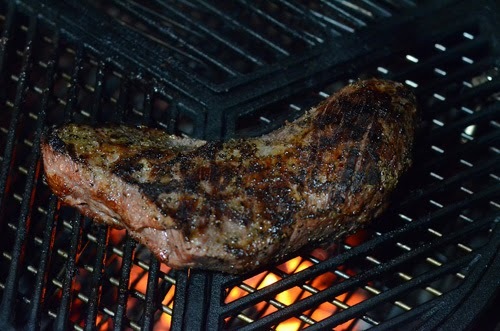 Grill the tri-tip with the lid closed. Flip about every 6 minutes and cook until the roast reaches an internal temperature of 127f for medium rare. This will take between 24 and 30 minutes. Remove and let rest on a raised rack for 10 minutes. Slice against the grain into 1/2 inch slices. A bigger target for getting it cooked to the temperature you want. For example, I want to cook this roast to medium rare (pull at internal temp 125-130f). If I direct grill close to a hot 400f, the internal temps will rise fast and the time the roast spends between 125 and 130 will be brief, heading straight on to overdone and dry. 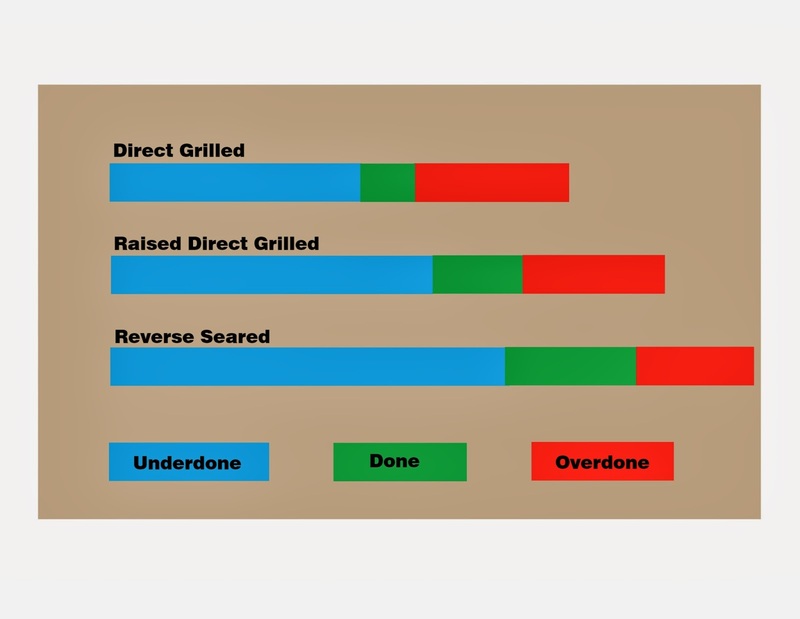 But doing raised direct grilling keeps it in that target range for minutes longer. For conceptual folks, think of your target range as a destination. For visual learners like me, look at it in this way in terms of length of time. Just a visual representation, not an actual graph, just to be clear. You can get the extra distance several ways. For grills with adjustable cooking grates, raise it up to higher settings. 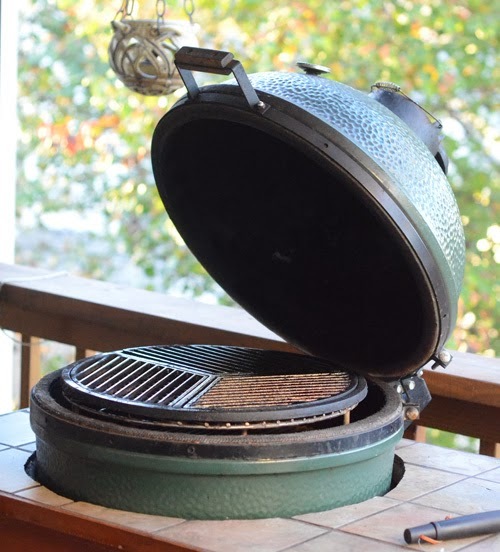 For grills with adjustable coal trays, lower it down. 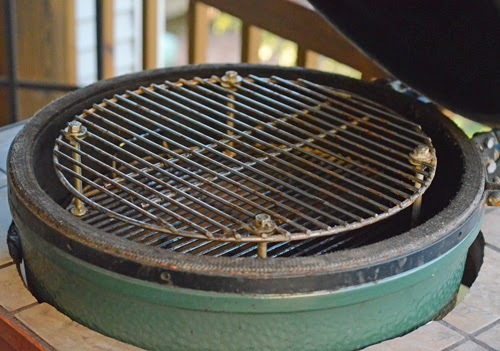 For kamado or grills with standard round grates, I like using a raised grid like pictured below. They are cheap to make and you can buy they parts at most local hardware stores. I still put my Craycort cast iron grate on top of that. Not required, I just like cooking on it. 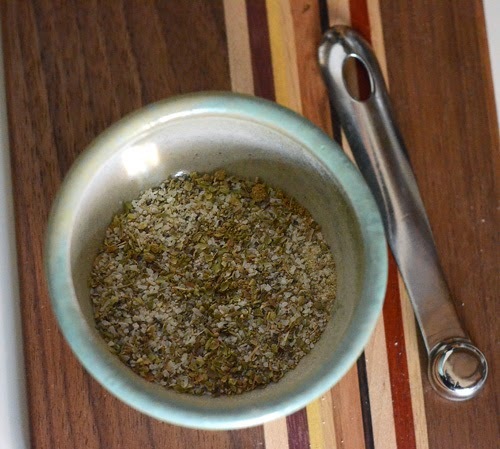 The green chile dust that I used was one that I bought after seeing reviewed on Hot Sauce Daily. 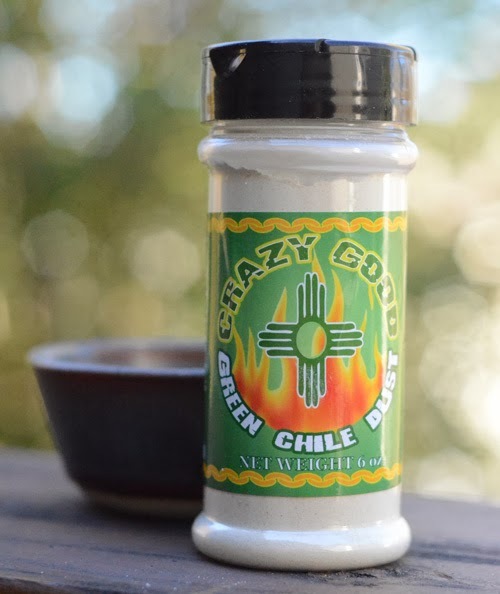 I figured that Crazy Good Green Chile Dust must be "crazy good" since they one a 2013 Scovie Award (those are a big deal in the chile head industry). 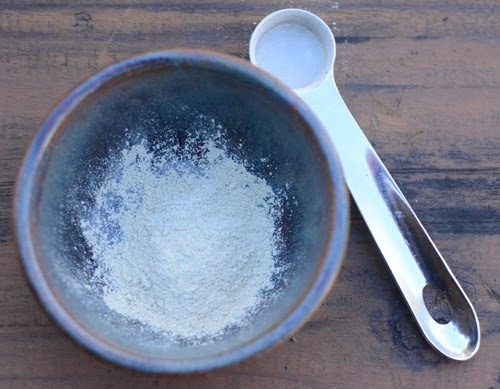 You can see the green chile dust isn't so green as much as it is a "green tinted off white". Tasted straight up it has an earthy flavor kind of like cumin but with the taste and mild heat of roasted green chiles. We like to save money by buying a bag of untrimmed tri-tips from Costco, trimming them ourselves and vacuum sealing them. 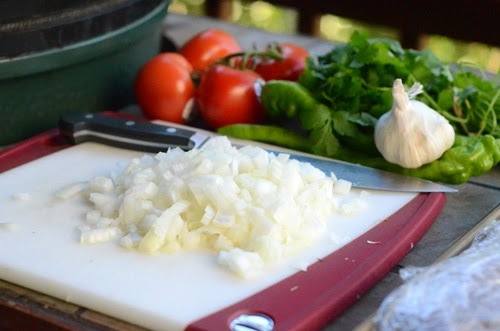 Cutting up veggies for the charro beans and salsa. 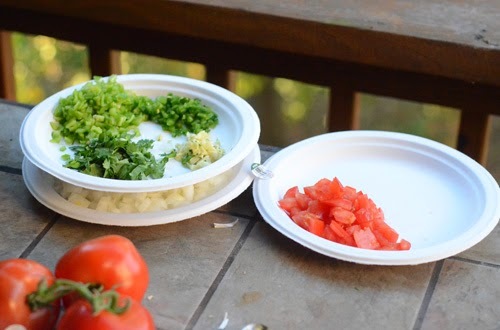 Grilling Tip: When counter space is a premium around grills, I like to use paper plates as "stackable mise en place"
The one slightly tricky thing about tri-tips is slicing them. 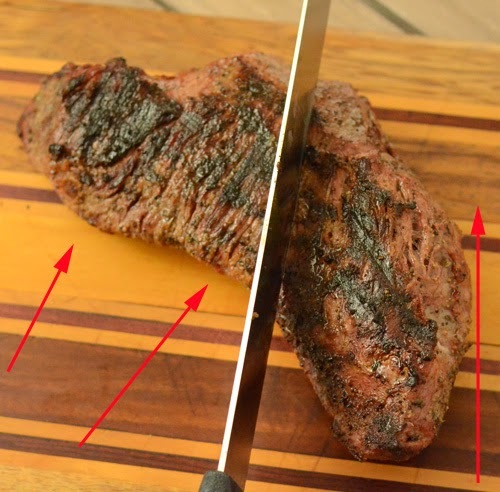 You need to slice them against the grain but the grain of the tri-tip changes direction (see the arrows in the picture). I cut it in half where the change occurs like this, then turn and slice against the grain. Fantastic meal and I am really enjoying tri-tips. I think the next one I do will be cooked sous-vide.